Commentary: While I'm generally quite pleased with this particular format, I'd be lying if I said C-3PO met my low expectations. He's slightly less poseable than the 2004 Original Trilogy Collection Vintage take on the figure, which also had five joints. While Hasbro's Mission Series sculpt is way better and gives the droid a ton of personality just standing there, it comes up short as a toy simply because the hip joints are restricted. 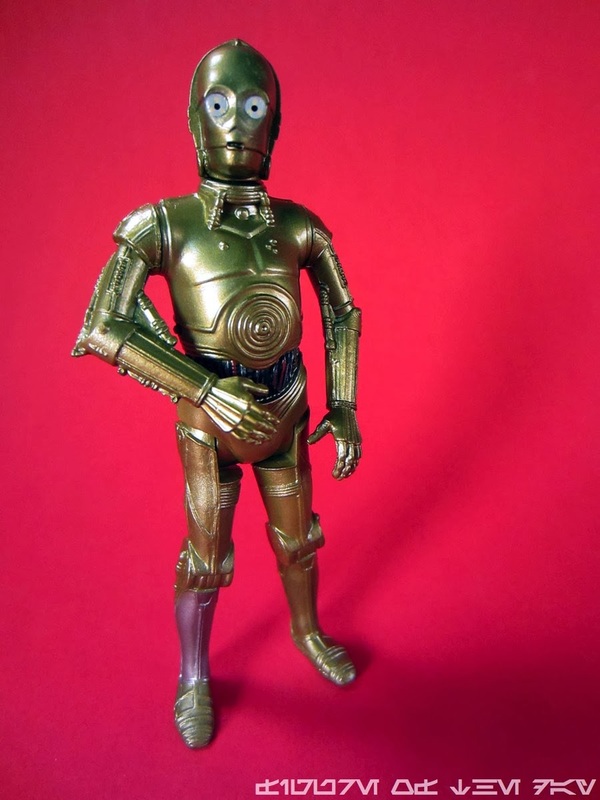 C-3PO barely can bend a few degrees forward, and can still stand on his own two feet while "completely" bent down. It's pretty unfortunate - Hasbro can do better, and has done better here. As a toy, it's not so great. But as a display piece? This is a winner - just keep an eye on the head deco before opening it. In my formative years, I often read that R2-D2 and C-3PO were the keys to the saga - the original trilogy is largely told through their eyes, and I read that they would be an important part of the prequels. It's odd that this is the first time the pairing ever got sold as a 2-pack in a non-exclusive format, but here we are. C-3PO's golden paint is similar to the 2010 Vintage version, in that it's not shiny. 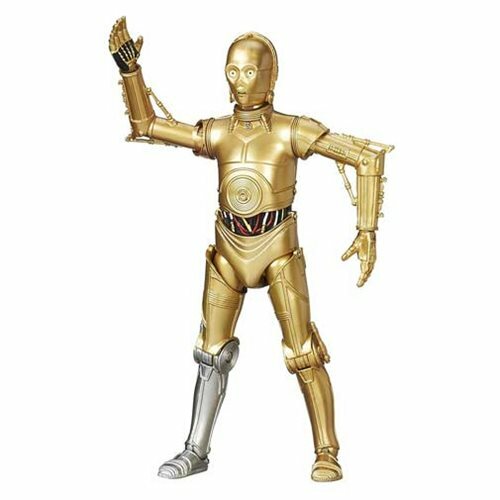 C-3PO's arms and neck rotate freely, plus he's got a silver right shin. The one place Hasbro has tripped up a lot on this character is his head, as most figures over the years didn't have painted black dots in his eyes - this one does, and some samples are looking up, or down, or in the wrong direction. My sample is nicely centered and while it looks good, it might have looked better had Hasbro elected to use a different color of paint or a different technique to decorate him. The figure spectacularly fails The Landspeeder Test, and is unable to fit in any vehicle require sitting. Maybe he'll be at home in the AST-5, CAP-2, or PDT-8, but he won't be driving Luke's car or sitting down in the hold of the Millennium Falcon. For diorama fans this may be a great choice - good custom fodder, too. You could have this one stand around Jabba the Hutt and it's a perfect fit. Since the character is usually seen standing and not sitting, I'll guess most people who buy it won't care that he can't sit. As a kid I would frequently put R2-D2 and C-3PO in vehicles together, so C-3PO having the ability to sit and drive around has always been important. While C-3PO does not meet my low standards for this series, he does stand well and will look good on a shelf, on your desk, or in a playset. The sculpting is good, the deco is fine, it's just that the engineering could use some work. I was under the impression that this line was meant to foster strong connections to the 1978 toy line, which means sitting. Ah well. Perhaps Hasbro will retool him on a future release, or give us a shiny metalized version down the road. I'd be game, but for now this two-pack will probably delight more kids than adult fans. 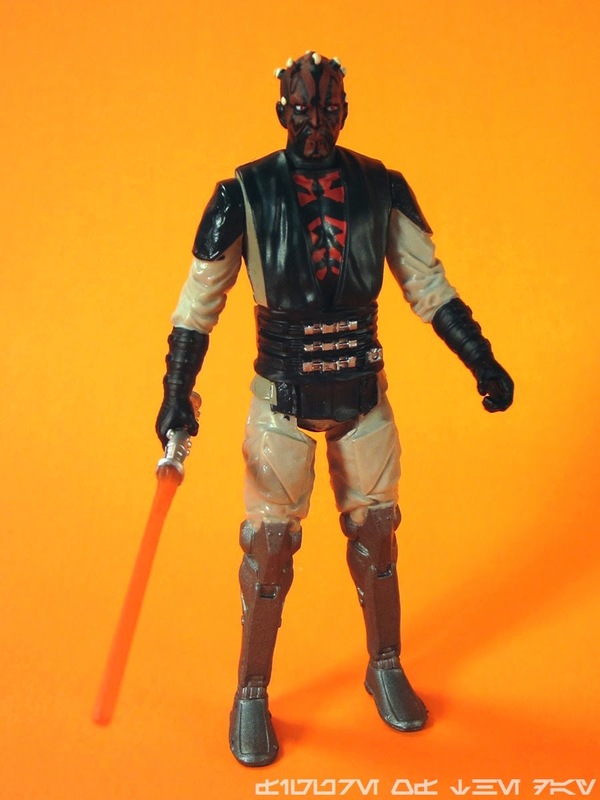 Commentary: Darth Maul is a solid figure - a new sculpt based on a never-before-made-as-a-toy costume. 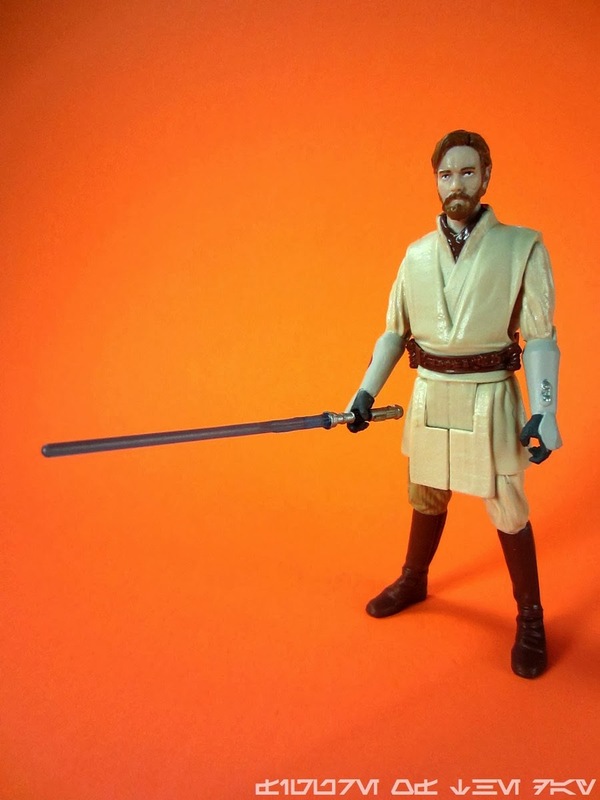 His companion Obi-Wan Kenobi takes a few shortcuts, adapting the existing Saga Legends mold with new deco and new arms. He still has 5 joints and can stand or sit relatively well, but it's worth noting it's an effort to cram him in the new, smaller Jedi Starfighters. It shouldn't be - they should just fit if they're designed at the same time, at the same company. If it's designed as a "kid line" there's no excuse for any compatibility issues if they nailed it back in 1978. Hasbro seems interested in reusing a bunch of parts in this line, and this is a clever way to do that. 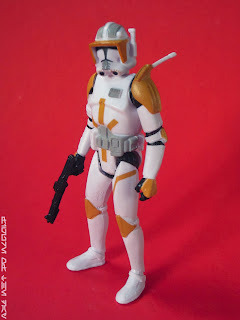 Modifying an existing movie figure to give me an Expanded Universe toy? OK. I'm game. The retooled hands have Clone armor wrists and can hold a lightsaber more easily. The range of movement is about teh same, btu the color scheme is different. Obi-Wan is less peachy and more ashen, his hair is redder and his outfit is a little less colorful. The sculpting is still good, but not fantastic - you won't be wowed by it, but you will be delighted by it. It looks good, the paint job is on the happy side of good as Hasbro painted his wrist communicator silver. He's also got a Cody to hang out with, that's a bonus. The open circle fleet symbol on his right wrist is also well-decorated, and I'm largely quite pleased. Hasbro has done numerous "movie" versions of Obi-Wan in some sort of clone armor since 2005, and while this certainly isn't the most dynamic, it's certainly the most desk toy-friendly. I've got an entire suite of Saga Legends and Mission Series toys on my desk as I type this, and not one of them has fallen over. Vintage and Black Series figures usually topple over eventually due to the ankles or some other issue, and these figures just do what they're supposed to do. They stand there, and they look good. I realize it may be unfair to lavish Hasbro with praise given the lower expectations out of a kid-driven $10 figure 2-pack in an era of $11 single-carded figures, but I'm quite happy with these. And yes, we'll look at more tomorrow. Commentary: Not every figure appeals to every collector. But this one appeals to me, so if you don't like it tough! I realize that's flippant but as I write this (about a week ago) I just got this Darth Maul in the mail and it's about 90% of what I want in my Star Wars action figures. If I get hate mail for this entry, I get an extra +10% in spite joy points which brings it up to a perfect score - so go ahead and send me the nasty emails you so do when I'm happy. IT ONLY GIVES ME POWER. This Darth Maul figure - and indeed the story from which he comes - are a bizarre mishmash of things that I don't think anyone would've seen coming, nor asked for, five years ago. Darth Maul got cut in half - he's dead! And 5-jointed figures? Kenner declared those out of vogue before relaunching Star Wars toys in 1995. The fact that this figure exists is something of a small miracle, and I don't even mind that this particular Kenobi vs. Maul costume match-up never happened. I get two good figures for ten bucks - I declare myself a winner here, and if you buy it I bet you'll enjoy it too. Darth Maul's feel as a toy, in my pocket as he hung out with me, was like a toy that fell out of some alternate universe time warp. The proportions, pose, and colors reminded me of a generic Jabba's Palace thug and I went to stand him up by Wooof and the rest. He fit right in. He's the right size to stand on a Skiff. Truly, this format is what people like me have been wanting all these years. The figure itself is good, but not likely to knock a lot of socks off. I find a lot of charm in his shortcomings - the five joints, the limited deco, even the tattoos not matching. The body has a bright, pinker color while the face has a darker, more subdued red. It feels like something old-school Kenner would've done, and to be honest I prefer the darker color overall. The colors are more toy-like, less subtle than the animation model - all of those greys blurred together, while here there's a striking contrast between the faux-metal legs, the light grey pants, and the black gloves. Sculpted detail is quite good, although the paint is a little sloppy. I'm seeing some black splotches where there shouldn't be any, although it isn't hurting my love of the figure one bit since they're usually in creases or folds around the pants. I have no reason to lament the lack of articulation because when it comes to 3 3/4-inch figures, I'd rather celebrate what we do have than mourn the spirit of something that may never come. Sure, Maul with 16 joints would've been cool. And yes, I'd have loved to see an Animated one. But this is very nice - he stands and sits well, and he fits in the Sith Infiltrator vehicle better than most other Darth Maul action figures since 1999. This alone gives him high marks in my books. I love the idea of a rogue Darth Maul jetting around the galaxy causing problems, and Hasbro gave me a figure that has managed to get right in to my inner 9-year-old. The quality of the figure - just in terms of paint - isn't up to Hasbro's usual standards, but it's not like I expect to see a better version of this figure down the road right now. It feels like a post-Return of the Jedi toy and for that reason I really love it. It could stand near the Fromm Gang or maybe a revived Grand Moff Tarkin or some other craziness, and as such it's very welcome in my toy stash. I got my money's worth. The body has been retooled for a badge on the front and a hole on the back. Each arm has new flourishes, you'll see some wires on the right arm and the aforementioned antenna on the left. Deco is a little light, but it's OK - this series trades away a little authenticity to keep costs down, and for anyone that collected the original 1978-1985 figures a few mistakes add to the authenticity of "old" figures. If it were perfect, it would be boring. His range of movement passes The Landspeeder Test and he easily fits in most current vehicles. Obviously anything requiring bent knees won't work, but the other stuff works just great. 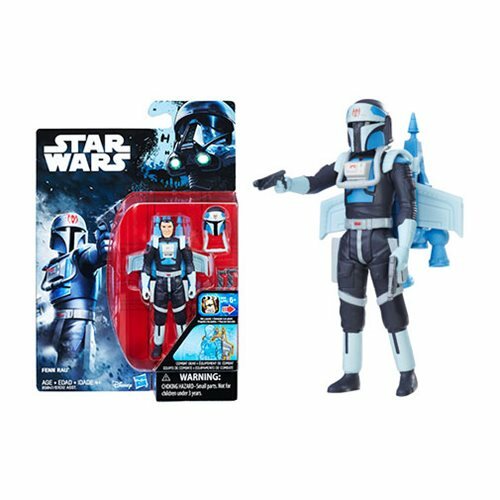 The only real downer here is that while a "real" Captain Rex is a new and welcome character, this is Hasbro's third new sculpt of movie Cody and I certainly wasn't wanting a new one. Had Hasbro based the design on the season 1 Clone Wars helmet I'd be very excited, instead of just being OK with it. It's the least exciting figure of this wave, but it's still pretty cool in the sense that this format of figure now exists once again. Get it cheap or as part of a lot/set/case if you can, I wouldn't suggest paying a premium to get one personally. Commentary: Merry Christmas! Hasbro teased a Legacy Collection version of the character which, to date, has not surfaced. Those wanting a movie-compatible version of Captain Rex have this figure as an option, and it's pretty good. It lacks numerous paint applications seen on the animation model, but it also has a few more marks than I expected - specifically the kill marks on his arms and legs. this is easily the most-decorated trooper in the line, and certainly the one with the most gear. It's worth noting that, for some reason, his pauldron is a separate piece. It's not easily removed, but you can move it around if you want. The figure also has working holsters, a first for this new Saga Legends assortment. To grant him full movement (and the ability to pass The Landspeeder Test), the figure's kama is sculpted to his legs and is not a separate piece. It looks good, and it works well. The rangefinder isn't articulated, but that's OK - I don't need movement as long as it looks good. 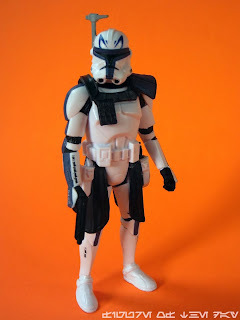 The figure seems to be largely based on the existing Saga Legends and Mission Series Clone troopers, but each and every part save for the arms seems to have sculpting changes made to them. There's even an indentation for his pauldron! Rex is completely lacking in battle damage, but dammit, he looks cool. You basically know what to expect from him if you've purchased other similar clones in 2013, and while I don't think he'll satisfy those who wanted a super-articulated movie-style Rex figure he's a good figure in his own right. I'm pleased to have him, especially for the price. Collector's Notes: I got this from Entertainment Earth in early December. I have not seen it in stores yet. You should checkout the Yakface.com image gallery for him - they do nice work there! Most Stormtroopers and Sandtroopers we've been getting for the past 10 years all come with parts from 2004 and 2005 releases - this is a complete refresh and it shows. The helmet isn't removable, and it looks a little bit wider. The head turns just fine, but doesn't have a ball joint. This figure passes The Landspeeder Test, which is my arbitrary test of determining if a retro action figure is designed properly. Getting Boba Fett in is a struggle, but the Stormtrooper glides right in perfectly. Kudos, Hasbro. 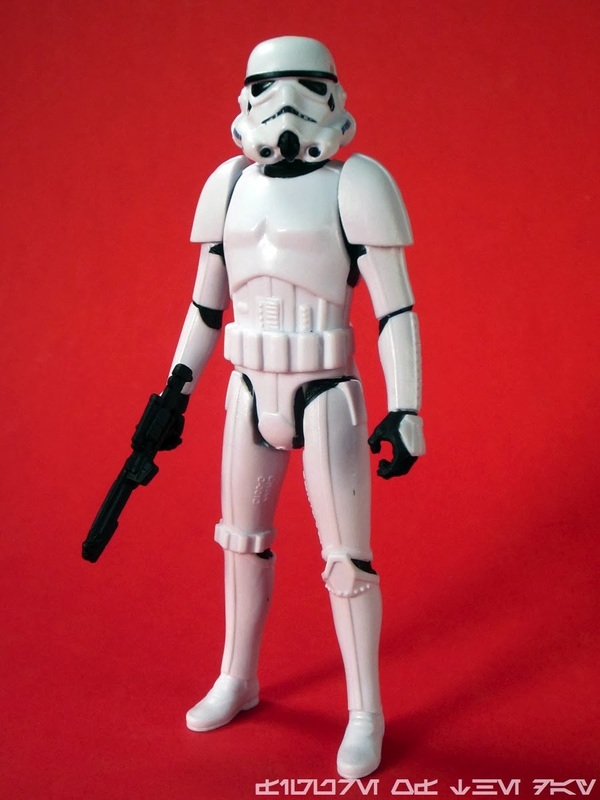 This is the Stormtrooper figure the old farts wish they had as kids - no holster to get in the way, the grenade is reduced a bit so it's visible but not an eyesore. The helmet sculpt is one of Hasbro's best, certainly at this size, and the only real complaint I have is that the grey highlights on the helmet are far to pale. Darken 'em up a bit just so I can see them. Otherwise? Greatness. This may well be Hasbro's best toy figure of 2013. Sure, the Black Series have more articulation and detail. Yeah, the 12-inch figures are bigger and provide more for the money. But this guy? This is as close as Hasbro got to making an all-new 1970s-style action figure this year, and everything about it just works well. It's a crowd-pleaser. And it also figures that it's a royal pain in the neck to get one. Or two. Or more. If I don't get at least six I'm going to get pissy, my Imperial Troop Transport demands new troops! Collector's Notes: I got this from Entertainment Earth in early December. I have not seen it in stores yet. I'd have bought more if I did. Commentary: This is the Boba Fett that we all were hoping we would get in 1995. When The Power of the Force collection came back, a 5-jointed expertly-sculpted figure is really what we all thought would be a reasonable thing for the relaunch - and Kenner gave us six joints, and for the day pretty good sculpting too. Of course in 2013 everything old is utter garbage to most fans, so it's worth saying that this new version of Boba Fett is pretty good. So! New sculpt. Boba Fett is the thinnest he's been in years, and feels right at home as a quasi-vintage action figure. The pose isn't quite retro, but it's close. 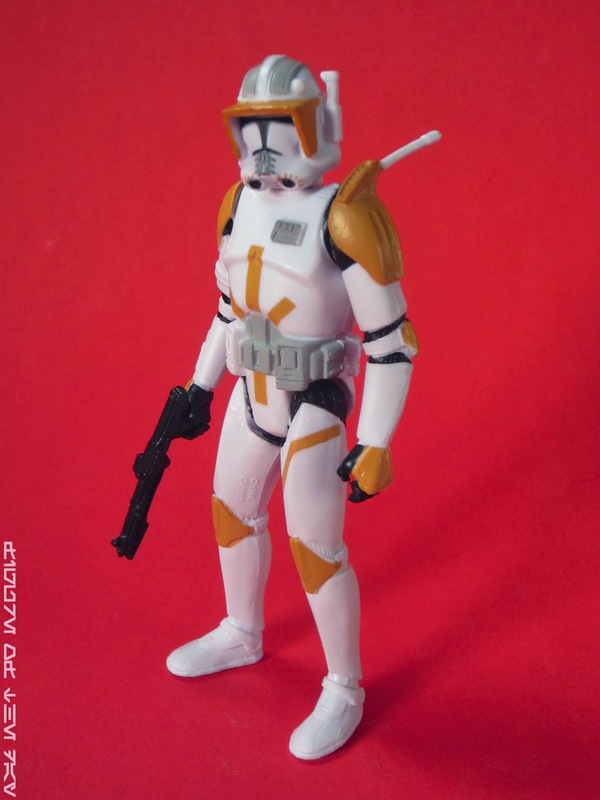 The arms hang at the sides out a bit, and the helmet seems to be more inspired by the unused appearance of the armored bounty hunter from The Clone Wars - note the points on his visor. Normally, Boba Fett has squared-off edges on his visor. 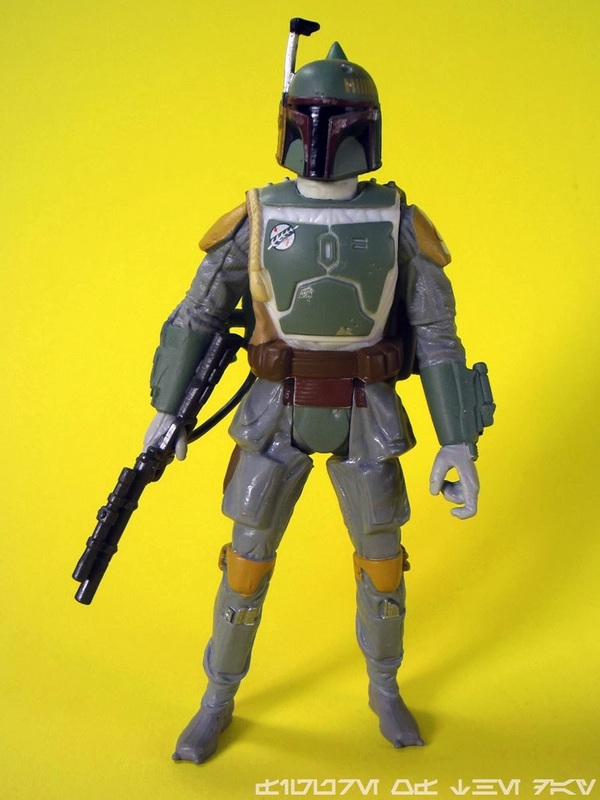 It wouldn't surprise me at all if, at some stage of development, this figure was meant to be a "realistic" version of animated Boba Fett. The lighter cloth around his chest armor stands out quite well, and I expect that the grey flight suit will continue to infuriate those who would prefer to see the more blue tinted version used on the movies. Me, I'm fine with the grey. Close enough. The neck is swivel-only, which, again, is good enough. There's no articulation ont he rangefinder. 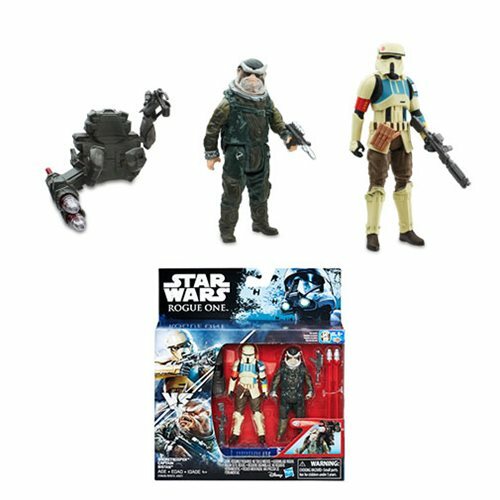 This is a very different figure from the 2012 Battle Pack Boba Fett, which also has 5 joints. The 2012 figure has a ball-jointed head, a separate piece for the cape, a second smaller blaster, and a more beefy build. The 2013 figure is much skinnier and seems more like the actual actor on-screen. 2012 is also taller, and has a far more intricate paint job. For his vehicle compatibility, I really like the 2013 model. For shelf presence, 2012 wins hands-down. 2012 can also hold his gun more easily, the 2013 figure's hands have index fingers too fat for the trigger guards. For six bucks, if you see it, you're going to buy it. What I say means nothing, it's a $6 new Boba Fett with probably the best proportions yet. Seeing his gauntlets or backpack with more paint would be wonderful, or perhaps a strange redeco or two - for example, 1979 Kenner colors with a red and yellow gauntlet. I'd buy that. Hasbro did a nice job designing the figure so that his cape and Wookiee scalps don't get in the way, but the gun's lack of true compatibility with the hand is frustrating. It's so close! The other figures are perfect fits, too. Ah well. Go ahead and get one.